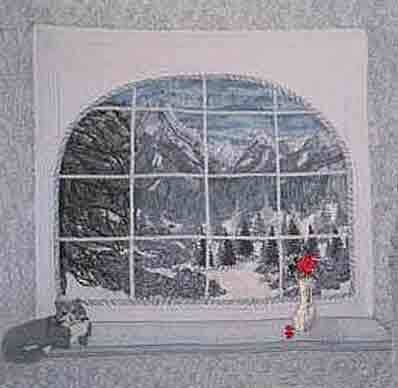 This quilt was made as a “Challenge Quilt” for the Evergreen Piecemakers Quilt Guild’s annual show. The challenge was to use only gray, white, and black fabrics – with just a “touch” of red. I won First Place and Viewer’s Choice with this piece. I used many techniques including: textile painting, stamping, cording, machine embroidery, couching and machine appliqué.